Small molecules that interact with the phospholipid bilayer are necessary for cell survival. These molecules take part in many tasks; nutrient transport, internal pH and osmotic pressure regulation, and the detection of specific signaling molecules. We are interested in investigating the interactions between the lipid bilayer and alcohols at a physiological relevant length scale. Alcohols can also serve as models for general anesthetics and are relevant for understanding how ethanol affects yeast cells during wine fermentation. This figure shows that alcohol molecules can instigate lipid flip-flop. Fluorescent molecules are common experimental tools used to probe the behavior of bilayer lipids and cell membrane components. Fluorescent molecules are generally large molecular weight, aromatic molecules covalently attached to membrane components or lipophilicly associated with the membrane. 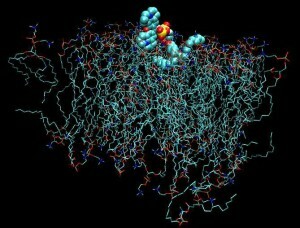 The assumption is that the fluorescent molecules or analogs behave in the same way as the lipids or proteins under study. This assumption becomes even more critical in single molecule experimental studies. Simulations could help in the evaluation of these assumptions. A commonly used fluorescent, lipid head-group label is Texas Red. Atomistic molecular dynamics simulation can provide a detailed understanding of how this fluorescent molecule might mimic or alter the behavior of lipids in a bilayer. Emphasis will be placed on comparison of dynamic behaviors of Texas Red-DHPE and DPPC lipids and on the effect of the fluorescent molecule on the structure and dynamics of neighbouring lipid molecules.